Ryobi P102 vs P103 Lithium Batteries: Which One’s Best? In the long run, the slightly higher power of the P103 is not really noticeable. In fact, it’s a matter of fractions rather than whole numbers. It probably won’t make any difference when it comes down to doing work with them. On paper, however, the P103 has just a sliver more power that gives it a very small boost in overall performance. Sometimes it is helpful to compare two competing products in terms of value delivered. That’s not the case when it comes to two batteries from the same maker from the same basic tool line. In that case, the comparison is pretty straightforward. Like in comparing the P102 and the P103. The P102 is significantly less expensive than the P103. That’s where the edge goes. The ability to operate in cold temperatures is a pretty big deal if you live where the temperatures are cold. Lithium-ion batteries have a reputation for not playing well with cold temperatures, however. Ryobi took their original design of a lithium-ion battery and made it so it can operate to really cold temperatures and lose its charge much more slowly. The P103 has that, the P102 does not. The P103 comes with a couple of features that the P102 doesn’t have, most importantly a battery charge indicator that lets you know the general charge of the battery. This will let you know vaguely when it’s time to keep working and when it’s time to swap out a dying battery for a fresh one. 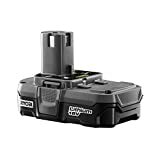 A good standby in the Ryobi One+ line of tools, the P102 carries a charge much longer than a standard nickel-cadmium battery and is powerful enough for most jobs around the house. Prices for this kind of battery have come way down in recent years, making it a lot more accessible to a much greater share of the tool market. Figuring out how much charge it has left is something of a guessing game, however, and it doesn’t like cold temperatures. Slightly larger and marginally more powerful than the P102, the P103 is designed for very cold weather and has a battery charge indicator light. It’s also a lot more expensive, in case you’re shopping on a budget. 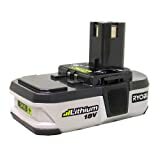 Both of these batteries are great parts of Ryobi’s One+ tool system. Invest in one of them and it will unlock a veritable universe of tools for every imaginable use. If you need to power up on a budget, the P102 is a great choice. It doesn’t have a lot of little extras, but it’ll do a good, basic job. The P103 is a little bigger, a little more powerful and is better designed to operate in the cold. It also has a battery charge indicator to let you know when it’s about to die. If you want a little bit extra and can afford it, it’s a great option in its own right.